Review: Hazel is a teenager with terminal lung cancer, a penchant for ANTM reruns and an obsession with a book about cancer by a reclusive author. 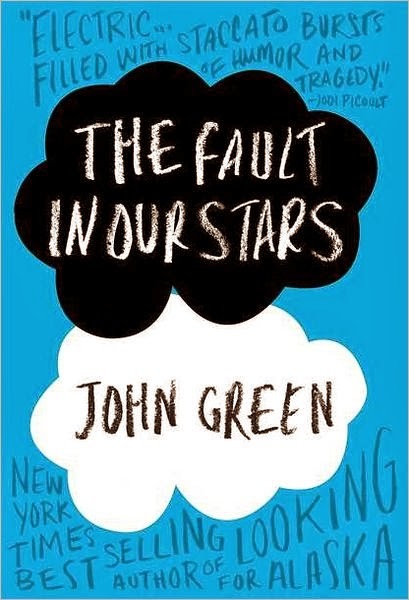 Her life changes when she meets Augustus Waters (teen who is in remission) in a cancer support group. This is a story about life, friendship and first love. Overall, I enjoyed the book however I found myself rolling my eyes at the main characters repeatedly. They do not speak like any teens I've ever encountered. However, while the ending was predictable, the characters wormed their way into my heart by the end and I was sobbing at the conclusion. When I was reading this I could not imagine this translating well on film because their conversations seem very "non-teen" (I know some people say they are more mature because of what they have been through, but if anything they should have been more socially awkward, especially Hazel considering she is pretty much isolated in her house and home schooled for years). However, after viewing the trailer the film looks amazing. Overall, I liked this. If you are looking for a short book that packs an emotional punch, you might want to try this one.